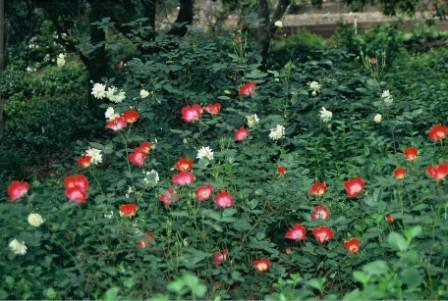 The rose Dortmund blooms under a canopy of hardwood trees in a free style garden. It is widely held that all roses need full sun. While a true statement I would modify it a bit. All roses prefer full sun but some can grow in dappled light. And grow happily! First though let’s decide what “full sun” is. In our rose growing experience full sun is at least 6-7 hours of full sun. But if it is only half a day of sun then it must be morning sun. A rose will be happy in a location that gets full morning sun but it will not be happy in a location that gets only afternoon sun. The fewer petals a rose has the more likely it will be happy with less sunlight. Keep that in mind and here are a few rules of thumb. At first don’t actually plant the rose in the ground. Did a hole for the pot the rose is in and slip the pot into the hole. That way if the rose isn’t happy there, you can just pull the pot out of the ground and try a different location. It make take several tries to find the right spot. You will know if the rose is happy because you are a good gardener. It will put out new growth, perhaps even bloom and look happy. A rose in less sunlight still needs the same care as a rose in full sun. Good soil, water and healthy dose of common sense. For further reading please see Stephen Hoy’s excellent newsletter on Single Petaled Roses.